Students don’t always choose to be at school at night, but sometimes it can’t be avoided. With looming deadlines as the semester progresses, more people find themselves at school well into the evening. Here’s the scenario: it’s 10:30 p.m. and you’re hungry. Vending machine food isn’t all that appetizing. Where do you go? And what other services can you access? The reality is Mount Royal University doesn’t offer many services after hours, but there is a committee working on changing that. 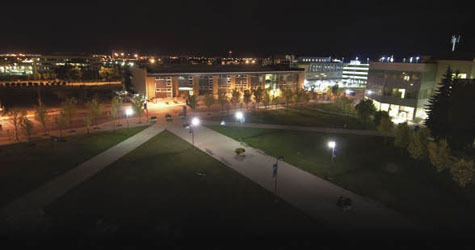 MRU@Night, a new school-wide initiative, is finding ways to make the school more hospitable to students and faculty members who are here at night. Although the campus may feel empty after hours, Reed explained there are anywhere from 2,500 to 4,000 people on site on weeknights, and the committee wants to make sure they are providing a good customer service experience, regardless of the time. As an MRU student, knowing what’s going on around campus is essential. The committee has already created different displays running after 5 p.m. on the flat screen TVs throughout the school, and is also providing printed material that lists various services available in the evening. There will be more places to eat and more options to choose from at night, including The Hub in Wyckham House and kiosks on the east side of campus. More maps will be available, and an electronic way-finding system similar to what you would find in a mall will be installed in the EB building. There’s also talk about a smartphone app that would help anyone find their way around campus, at all times of the day. Students said they wanted a way to easily find the busses coming to campus at night, and where they stop. MRU@Night has published a pamphlet listing all the nearby stops and their codes so it’s easy to call the tele-ride system and get the times of the next bus. More study space is an issue for everyone on campus, not only night dwellers. The committee is looking at ways to make sure students have 24-hour access to quiet study areas and group work, especially during exam times. Students are not the only ones who feel that the lack of services affects their time at MRU. Faculty and event organizers are finding it difficult to receive assistance, whether it is with way-finding or technical support. Environmental science instructor Diana Fletcher echoed this concern. “If you need help there are very few people to help you,” she said. “Right now, there’s not much. Brian Fleming, VP of student affairs and campus life, said, students have been frustrated with a lack of consistency. He said several strategic issues need to be addressed and they would like to see all the information people need to survive Mount Royal at night contained in a single virtual and physical location.